Zanele Muholi's exhibition Somnyama Ngonyama, Hail the Dark Lioness, now opens at Fotografiska 9 februari – 1 april. 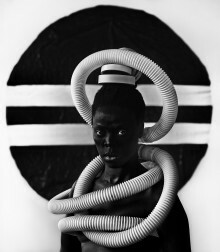 Presented by Fotografiska in partnership with Autograph ABP, South African visual activist Zanele Muholi (b. 1972) and curated by Renée Mussai confronts the politics of race and representation in the visual archive in her ongoing self-portrait series Somnyama Ngonyama.